Cornerstones of Science invites all Maine public libraries to attend our annual Library Partner Summit, held this year on Friday, December 12th from 8 a.m. to 3 p.m. at the Auburn Public Library (49 Spring St, Auburn, ME). See Summit Agenda here. The day includes sessions with Cornerstones staff, science providers and peers on ways you can bring science alive in your library; catered lunch; and time to network with other librarians. We will provide travel reimbursement to all participants. Registrants include many of our long-time library partners, other libraries that currently participate in our hands-on science programs, and others that will be learning about us for the first time. Registration is free! Registration deadline is Wednesday, December 10th at Noon. Questions? Call us at 208-8975 or email peggy.schick@cornerstonesofscience.org. Click here for directions to the Auburn Public Library. 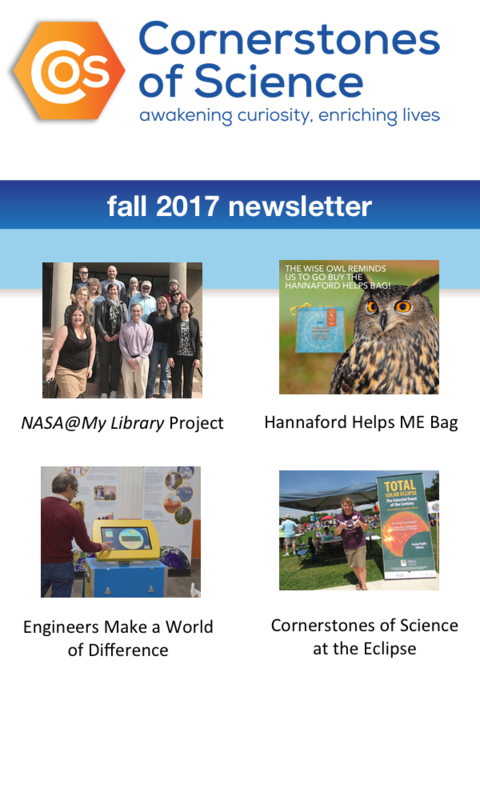 See our Programs page for more information on the types of Cornerstones of Science programs our Library Partners offer to their patrons. NEW this year: Library partners that have a telescope through Cornerstones of Science may bring their scope to the Summit for on-site modifications and small repairs. Please let us know in advance if you will do this and what maintenance or modifications are required. We also will have newly updated telescope manuals to replace those in your existing telescope pouches.